I just got back from a great meetup that Keith Ozar organized at 3D Systems offices in Manhattan tonight. They showcased the new CubeX printer and a new version of its software that they have in development. The conversation we had is one that I keep having: In order for 3D printing to get a critical mass for home users, the software has to get better. Currently there’s too many softwares needed to print models and too many steps needed. Likewise the controls for printing objects need better control. IMO, there’s two aspects to reprap style FDM(filament deposition modeling) 3D Printing slicing software that need greater levels of control; support for overhangs, and infill settings. I’ve been thinking alot about how interfaces could be created to improve upon these issues people face so I wanted to share some thoughts. With FDM 3D printing, anything in a model that has sharp overhangs will often need to be printed with support. When support is enabled, the machine will print extra material to support the overhangs in the print. The problem is that this means that you have to sit with an Xacto knife and cut away all the excess plastic and its a lot of work and the surface will never be as nice. When support is enabled, the software will automatically add support for any overhang on the print, but its only all on or all off. A lot of times little overhangs will print well, expecially on thin layer heights. 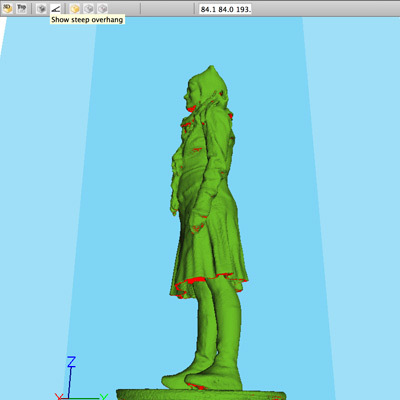 In this case, I would want to print support for the model’s skirt, but not the chin or the hand. Those overhangs will look better without any support because all the cleanup work will mar the surface. The interface I envision would allow users to click/select highlighted areas like the bottom of her skirt to apply “selective support”. This is my #1 feature request in slicing software. Lastly, when you place a number of models together on the build plate, every software applies global settings to everything on the plate. 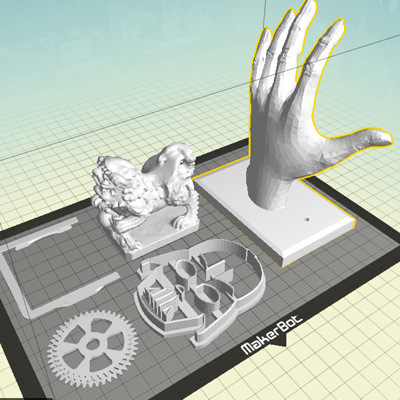 With the time it takes 3D printers to execute prints, it would be nice to be able to specify different print settings for each item on the plate. 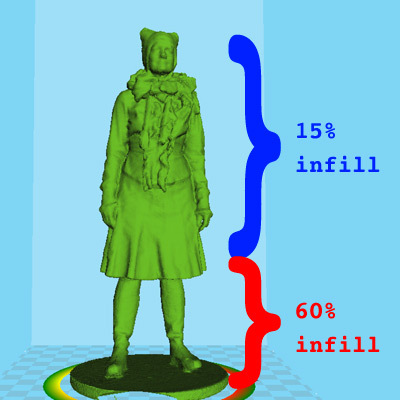 For example, in this scenario, some items need to be solid, some need to be only 15% infill. One item requires support, but most don’t. It complicates the usability of the software, but when you’re facing print times that exceed 24 hours, having this level of control would be worth it. I envision a dialoge that allows each item’s slicing options to be set the same by default, but that could allow item by item controls when needed. So that’s it! Three things I would do to improve slicing software for FDM 3D printing. Its amazing how fast all this is improving and I hope the right people take notice of this post. Sure the machines are getting better, but the software is really what is going to make people want to use them. This entry was posted in 3D Printing and tagged writing. Bookmark the permalink.